Hahahaha! This is month of competition oh. Early this month, GLO launches a heartbreaking data awoof plans, i.e GLO 2GB For N1,000; 6gb for N2,000; 10gb for N2500; 48Gb for N8,000; etc After some days, Airtel was annoyed because their customers are now swapping to GLO, so they now launch Airtel 2GB for N200 and 6GB for N500 on 3G, 4G Network Mobile Phone Today, MTN is starting their own with this 500% bonus on any recharge for good 6months. 1) Buy and register a new sim. 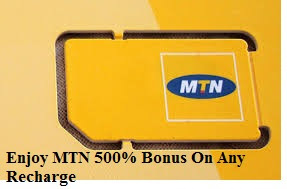 Note: The bonus will expire in 7days while your normal airtime still remain.